This dramatic Jan Constantine collection, inspired by the colours and symbols of Latin America, is made from black felt wool and appliquéd with bright and bold motifs. 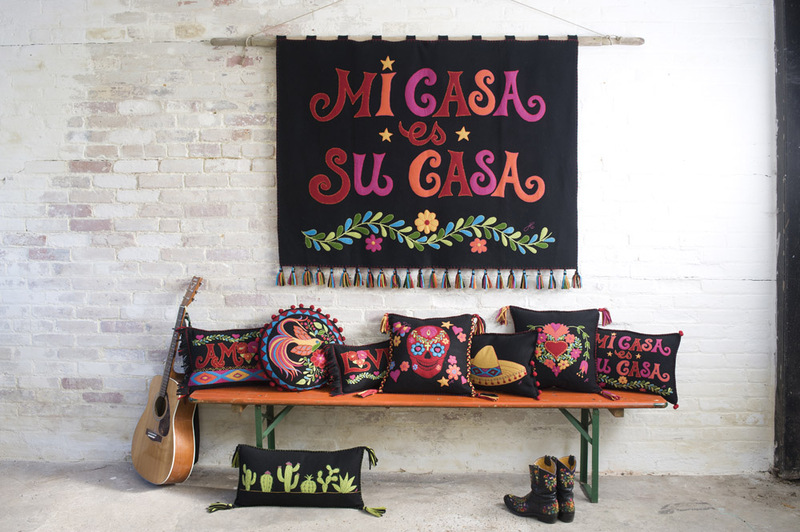 The main message ‘Mi Casa es Su Casa', meaning ‘My Home is Your Home’, is embroidered upon wall hangings and cushions. The heart motif and the words ‘Love’ and ‘Amor’, which are intrinsic to Jan’s work, also make a stand, embroidered upon cushions and throws. The sKull and cactus designs heat up the Mexican vibe, trimmed with the pom poms, tassels and fringes.